This entry was posted in Safety gear & equipment on 2018/07/25 by Susan. Summer is a good time for heli-ski guides to figure out the best hearing protection for wearing with helmets to minimize exposure to hazardous noise levels. 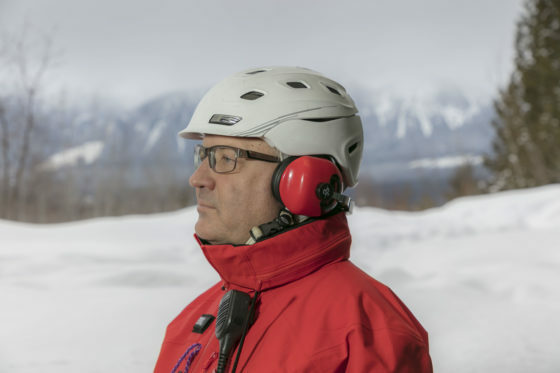 Heli-ski guides have many things to keep in mind when it comes to safety – one of which is how to protect their hearing. Most of heli-ski guides’ exposure to hazardous noise levels (above 85 decibels) occurs when they’re inside the helicopter and when they’re loading and unloading it. This means they need to use hearing protection while they’re in or near the helicopter, but not while they’re skiing with their clients. See much more information on this topic in Hearing protection for heli-ski guides, a new bulletin from WorkSafeBC. Heli-ski guides are also required to wear helmets. But since some types of hearing protection are awkward or uncomfortable to use with a helmet, some guides end up choosing not to wear hearing protection. She adds that many guides saw it as an an “either-or” situation and felt they couldn’t wear their helmets and their hearing protection at the same time. The result was that hearing protection wasn’t being worn. Heli-Cat Canada (an association that represents the helicopter and snowcat skiing industry) approached WorkSafeBC to find solutions for this conundrum. Some guides were using helmets with ear flaps, and they wanted to test how effective this was. Researchers placed tiny microphones in guides’ ear canals and on their shoulders, then tested noise levels of four different types of helicopters. What was the result? Ski helmets with ear flaps don’t provide any hearing protection. What is the overall effectiveness of several brands of ear-muff style hearing protection? You can see the full report for detailed findings. Essentially, it recommends that guides use over-the-ear muffs with thin toques or balaclavas. They should avoid wearing thicker headwear under a helmet because that can limit the earmuffs’ effectiveness.